The Chunnel, as it is referred to colloquially, or Le tunnel sous la Manche, as it is known on the French side, is a 50.5 kilometer (31.4 miles) undersea rail tunnel that connects England (UK) with France. The tunnel, which at its deepest reaches 250 ft, carries high-speed passenger trains known as the Eurostar, in addition to shuttles with vehicle transports and freight trains. The tunnel project, which was originally proposed by a French engineer in the early 1800s, began construction almost two centuries later, when tunneling began in June of 1988. One of the biggest opponents of construction of the tunnel project was the cross-Channel ferry industry, which stood to lose a lot from the creation of an alternate mode of transportation across the Channel. 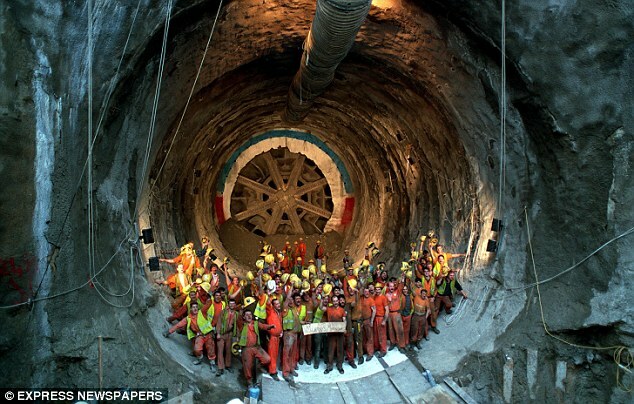 To construct the elaborate tunnel, eleven tunnel boring machines bored their way through chalk marl to create two rail tunnels and a service tunnel. Work began simultaneously on both sides of the Channel in England and France. The tunnel finally began operating in 1994, after being formally opened by Queen Elizabeth II and French President Mitterrand. Final construction, which at its peak consisted of 15,000 workers, went over budget by about 80%, making the total construction costs equivalent to £11 billion in today’s world, which is around $16.6 billion.